The Education Select Committee yesterday heard from various witnesses about the draft legislation on Special Education Needs. Over two and a half hours, professionals gave their views about the draft bill. In this first of two sessions of oral evidence, the Committee heard from local authorities, health, SEN organisations, educational institutions and OFSTED. One of the major concerns that was voices by the professionals throughout the hearing, which I watched online, was the lack of statutory duty on health to ensure that they provide for the needs of children who will have an EHC Plan, even though that came with complexities and difficulties. Peter Gray from the Special Needs Consultancy said there was an issue for parents around the fact that a single agency (the local authority) would have to enforce commitments from another agency without the authority to see it through and so any agency named to provide for a child’s needs should be duty-bound to do that. Another issue that was generally agreed upon among the witnesses surrounded the ‘local offer’. Most believed that any local offer should be framed around a national framework to avoid the potential for post-code lotteries. This could be, for example, a national offer with a quality framework and local variation. This would mean that there would be a consistency of provision for every child with SEN, wherever they are in the country, whether or not they have an EHC plan. It was noted that the local offer was not individualised and it need to be made clearer what was required - was it a directory of services? Would there be parental entitlement or expected pathways and would it properly include schools and be inspected by OFSTED? Christine Terrey, Executive Headteacher of Grays school and Southdown Junior school, said that many schools had no idea what would be required of them for a local offer and had no idea of what to put in it. Another witness said they believed that if parents knew what was available by law locally, they would have less need to pursue a ‘piece of paper’. A third main theme was whether there should be a delay in the legislation - something I believe should happen. Kathryn Boulton of Blackpool’s Children’s Services (which is not a pathfinder authority) said she believed that there had not been sufficient time and many pathfinders are still in the recruiting phases - which I know to be true. She also said there was a lack of clarity about how personal budgets should work and that the learning from the pathfinders should be allowed to develop to allow the bill to be properly informed. Jo Webber, of the NHS Confederation explained that the new Clinical Commissioning Groups (CCGs) should, in the main, be authorised by next April, but under the new system, provision for a child with severe or complex needs or a physical condition would need commissioning from up to eight different parts of the NHS. There was, she said, a need to seek more clarity, which would take time. Dr Charles Palmer, from the CYP service in Leicestershire said he believed there should be a delay because expectations of great improvements to the system have been raised among parents’ groups and there is a real danger that with the budget restrictions those expectations simply would not be met. He said that in his local authority they were already restricting the range of children and young people who were being supported through the process so that they would have enough money to help the most needy children. Another issue that was highlighted was how to proceed with the reforms, taking into consideration that delegated funding for schools was already in existence and couldn’t be clawed back because of the minimum funding guarantee. Kathryn Boulton said that funding was not aligned and uncoupling delegated funding was going to be very complicated and could lead to variances across the country. Because of the Minimum Funding Guarantee it might not be doable. One point - very close to my own heart - was the provision of mental health services from CAMHS. As I have written before, there is a very long wait to access even an initial appointment from CAMHS, let alone the appropriate follow up care. Kathryn Brown said that the bill should include a specific reference regarding mental health services in the overarching mental health provision. She noted that mental health needs very often run alongside complex SEN and there should be a requirement for mental health provision to be outlined clearly. Regarding the draft bill proposal for compulsory mediation, a question was raised about lack of a mechanism to provide arbitration between health and education. Peter Gray believed there should be joint accountability between health and education and a duty to cooperate. 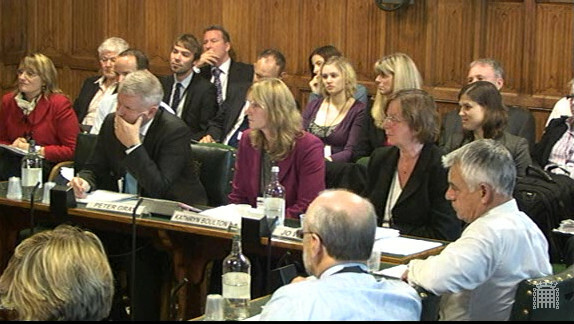 In his evidence, Dr Charles Palmer, said he did not believe mediation should be compulsory, while Brian Gale of the National Deaf Children’s Society said that if mediation was mandatory then it made no sense that there was no statutory obligation on health to provide or to mediate and without this, there would be no improvement. On the issue of transition, there were concerns about coordination, in that adult services do not mesh with those for children and young people regarding the ages at which services stop. Jo Webber said the extension of an EHCP up to the age of to 25 would have an impact on health service provision and costs. Peter Gray said these costs, which included admin, monitoring, provision and review costs should not be underestimated. The reforms also raised the question, said Kathryn Brown of the costs on local authorities of moving from old to new system and great thought needed to be put into resources and capacity. Would children and young people with a statement be automatically moved to an EHCP and would people post-19 but under 25 who had ceased an educational statement need to be reassessed. The draft bill provisions do not have this clarity and the time and mechanics needed should not be underestimated. It has been my personal understanding during our pathfinder that children with statements would be left until there was a reassessment need at a review or a transition point was reached, but this is not clearly stated in the bill. Kathryn Brown also believed that an EHCP should be maintained for a vulnerable Post-16 young person even if they leave education, if they enter an apprenticeship or if they go into custody. The latter should be needed for safeguarding reasons. Dr Palmer said that the timetable for an EHCP should be linked to that of NHS waiting times - 18 weeks, instead of as at present, six months from referral to statement. Additionally, through the commissioning process there should be clear children’s leads from NHS commission, through local area teams and to clinical commissioning groups to ensure that children had a clear voice at each level. One vital issue that was raised is that of the SEN Code of Practice, a significant document for schools and parents alike. The CoP will need to be revised or completely rewritten to come into line with the new reforms but, at present, it was noted that there is not duty for t to undergo parliamentary scrutiny and this was unacceptable. Brian Gale said that the new CoP needed to be right from the start - you couldn’t risk loose ends and then find that for the first cohort of children it didn’t work, thus jeapordising their provision and having to fix the new CoP retrospectively. Mr Gale also related that in his experience, parents do not believe the bill will make much difference because services are being cut every day and it is very difficult to convince them that against this backdrop, there will be an improvement. He also noted that when it came to a review of a plan, it seemed that only providers were consulted and not the child or the parents and looking at issue of funding - everything is being discussed by the Schools Forum where there is no representation from parents or young people. Regarding the definitions for SEN, Philipa Stobbs of the SEC/Council for Disabled Children, said they would like the term ‘disabled’ to be clearly included in the definition of Special Needs for an EHCP, as some children with disabilities do not need special educational provision. Any new definition must improve the professional decision-making process for when a child has SEN because at the moment, the definition was too narrow. A statement used the term ‘specify’ while the draft bill, at the moment, used the term ‘sets out’ which will only give rise to wooly EHCPs. An EHCP should have broad outcomes and specific objectives, for example age appropriate language, ability to eat independently. There was a concern that some children with a ‘Band A’ statement would not qualify for an EHCP but there was a belief that all children with current statements should automatically do so. Hello, am going to include this in the BritMums Education Roundup, due out on Wednesday 14th November.